Geek Podcast – Listen now! Today we've got a few DCC reviews: Emirikol Was Framed! and Pulp Weird Encounters 1: Tomb of the Squonk & The Silent Army (DCC). Today we're spotlighting a review of the new 5E Vampire: The Masquerade. Today's strategy game reviews cover Space Empires: Replicators (a 4X board game) and Cerebria: The Card Game (a set-collection card game). Today we've got a look at The Wizard of Zo (for 5e) and Chromed Flesh (for Shadowrun). Fuzzy Thinking introduces Frugal Fighters. Then we've got some reviews of new FRPG sets: the Stranger Things Dungeons & Dragons Starter Set and the RuneQuest: Roleplaying in Glorantha - Slipcase Set. 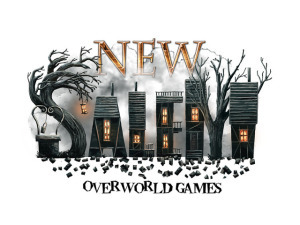 As heard on one of our most recent broadcasts during an interview with Overworld games, they have a new game coming out called New Salem. This game just blew threw all of its funding goals on Kickstarter including both of its stretch goals! With $19,492 funded out of an original goal of $13,000 it was not even close which is exactly how it should have been! With 630 backers in total and this bodes well for the game. There is a lot of interest and we can not wait to get our hands on ours! GeekLine415 offers a full and hearty congratulations to Overworld games and we wish them continued success! “This project is officially successful! Everyone will soon get to hunt down those Witches, give Hope to their fellow Puritans, and clear the Despair out of New Salem. The two of us are extremely grateful for everyone’s help in making this happen and of course to Andrea for his incredible artistic vision that will bring the town to life. GeekLine415: 4 Geeks for Geeks! Geekline415 is a weekly live radio show available only on FCCFREEradio.com. You can listen live or via podcast from right here!. Geekline415 is for all manner of Sci-fi/Fantasy, books, tabletop/rpg games, movies, and video games of all kinds. What are people saying about Geekline415? How can I get in on the fun?